There are times when reporters have questions that need answers quickly. It’s during these moments that many turn to the internet for a quick fact check before finishing up their article and submitting it. Google and Wikipedia are good resources, but each has potential drawbacks. Google might omit relevant answers as mentioned in an earlier post and Wikipedia’s open editing stance can lead to misinformation by anonymous or biased editors. While each of these problems are generally minor in the grand scheme, there are alternatives. 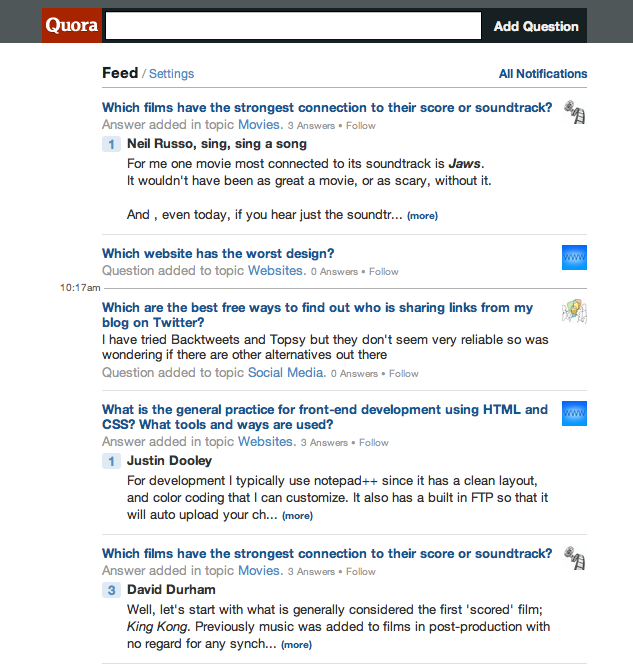 Quora is one such alternative, and it provides a unique interface for users. Unlike Wikipedia, which allows almost anyone to edit an article, Quora restricts edits and answers to members of the Quora community. Quora also sets up the articles as threads where one person asks a question and the answers are listed below. This keeps inherent biases or errors in knowledge from becoming lost in the multiple edits of users. 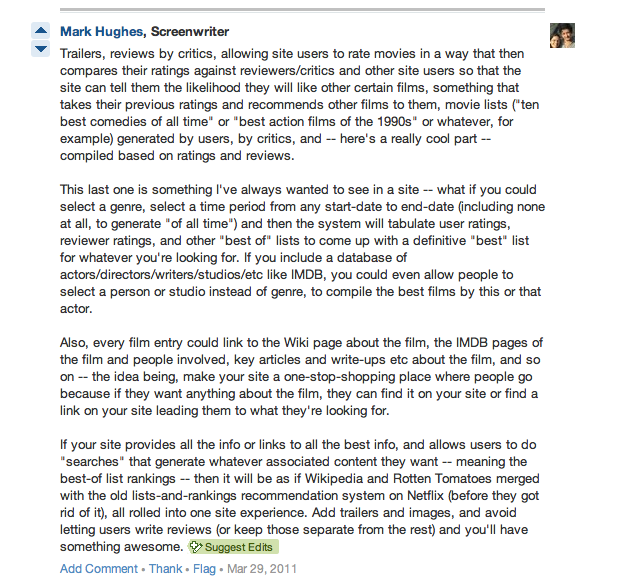 Users can suggest edits to answers and post their own responses to answers in addition to the original question. Quora uses response ratings like Reddit which puts popular answers at the top regardless of when they are posted. Quora aggregates a news feed similar to those on Facebook and Twitter. It updates as new questions and answers are posted about subjects the user has listed or people the user has decided to follow.This allows users to keep up on subjects they are commonly interested in. You can also follow particular questions and answers to see if they are updated over time. My news feed currently follows social media, film, and journalism topics as well as a few people I know with Quora accounts. You can also search for questions and subjects outside of the ones your feed produces. If someone wants to find out about horse racing but only follows questions about space exploration, they can search for the topic in the search bar. The search bar also opens up a dialog box to ask a new question if a related question with proper answers cannot be found. This makes asking questions an easy task for the novice Quora user. The most difficult aspect of Quora is getting started. There are a lot of users asking a variety of questions and it can be difficult to build up enough of a reputation that your questions will be seen and answered. The best advice I have heard on building a Quora reputation is to ask clarifying questions to answers already posted. Unlike brand-new questions that are released into the Quora void, comments send notifications to users. This increases the chance that they will see and respond to your question. It also increases the potential that people will start to follow you. You can then start posting answers to questions and gain more followers if your answer becomes popular. It’s better to start with clarifying questions rather than answering questions because it allows you to increase your reputation while learning what makes for a good response. You could be one of the most knowledgable people on Quora, but others may find your answers unhelpful if you don’t spend some time learning how the system works. Lurking and ranking answers is also a good strategy for learning how Quora works before jumping in with questions, answers and comments. Observing what works in popular answers will help you understand the best way to respond to questions or even ask questions to generate the answers you need. Quora would best be used by journalists to reference events that happened over time. The upcoming 2012 elections could benefit by research on Quora to find out about politicians. The website already has a GOP 2012 topic on the candidates as well as a topic on the general election field for 2012. Reporters could consult these questions as the election draws near to find out if any areas they missed in their own research. 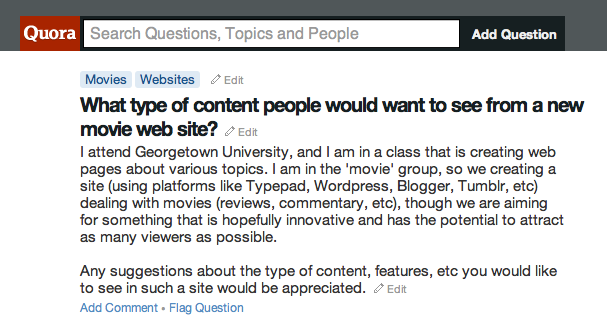 Quora could also be used by reporters to find out what topics interest the Quora community. Reporters could consult Quora to find out if there are a string of unanswered questions on a topic they are familiar with. They could then write-up an article on the topic and submit it to the community to see if there are any remaining questions before posting it in its final form. While this may negate some of the traffic generated about the article on the news website, it would allow a large group of people to fact check and comment on the article. Quora’s database isn’t as open as Wikipedia or as expansive as Google’s search engine, but the website strives to give the best possible answers to questions posed by the community. Reporters can turn to the community for specific information that Wikipedia or Google cannot provide. The biggest drawback to Quora is the potential for a slow response time to your questions if they haven’t already been posed or if you’re not a popular enough user to receive quick responses.